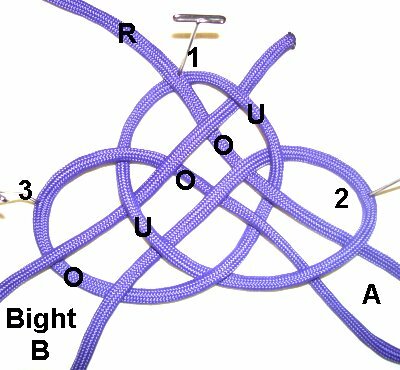 Description: These Double Coin Patterns both start out with the Josephine knot, also called the Double Coin Knot. 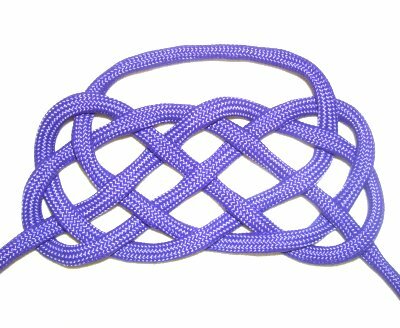 This decorative knot can be used as a starting point to form other shapes and knot designs, like the ones shown. I had a little fun while I was tying the knots, as you can see in the image above. 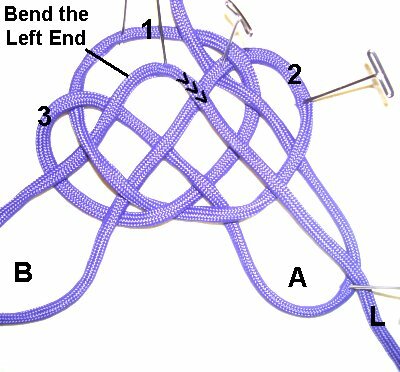 Children can make a project of tying decorative knots to make interesting shapes, so encourage them to practice. 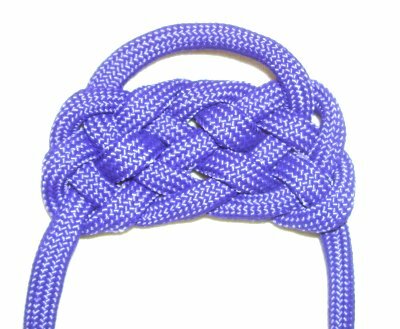 The Wide Lanyard knot has a rectangular shape, with a wide loop at the top. The Mayan temple knot has a rounded triangular shape, with an opening near the center. 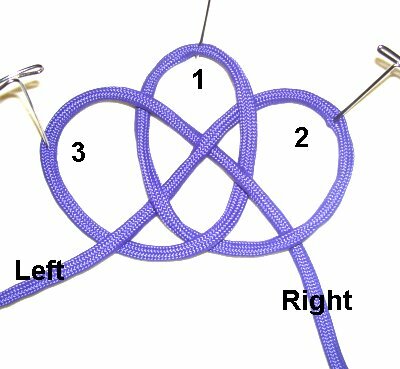 Both of these knot designs are suitable for pendants or focal points for Macrame bracelets. The material used in the example is Paracord, which needs to be prepared and finished by melting the ends with a flame. 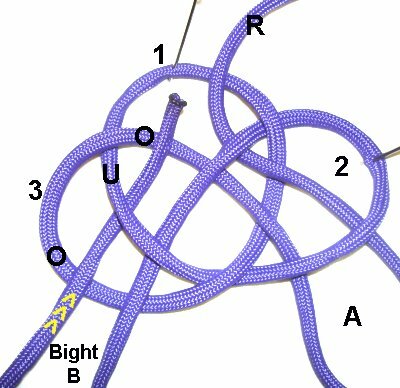 I found both of these Double Coin Patterns in Decorative Fusion Knots, written by J.D. Lenzen. 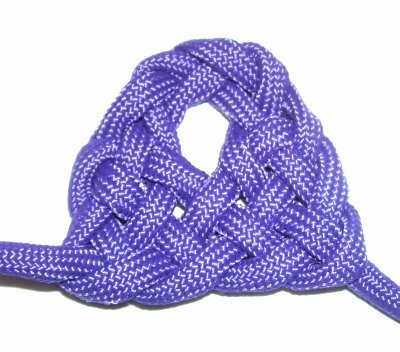 Be sure to click on the link or image to visit his website, which has a large video gallery of interesting knots. Step 1: Secure the center of the cord to your board. 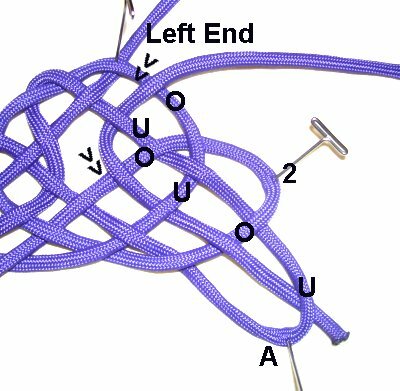 Make loop 1 with the left half of the cord, rotating counter-clockwise. Pass the end under to form the crossing point on the left. Step 2: Move the right half over loop 1. Moving clockwise, bring it under the left end towards the top. Step 3: Weave the right half through loops 2 and 1, heading down and to the right. Pass over - under - over - under the four segments. 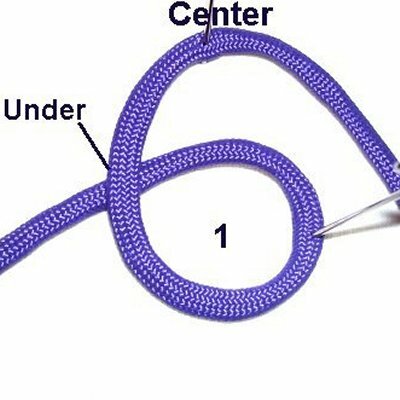 Step 1: Tie a large Double Coin Knot in the center of a 60-inch cord, following the instructions above. Mentally label the loops as shown, and the ends where they are resting now. Design Tip: The weaving sequences in each step of both Double Coin Patterns is very important, so be sure to look at the images closely. You can click on each image to see a larger view. Step 2: Fold the right end to form Bight A, moving counter- clockwise. Weave under - over - under - over the four segments, as you bring it to the upper left. 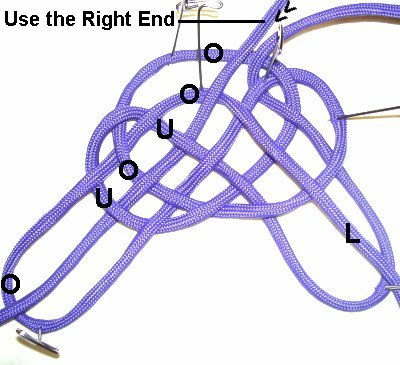 Step 3: Fold the left end to create Bight B, moving clockwise. Weave over - under - over the three segments. Before you move on, spread everything out, so the bights are as wide as possible. Step 4: Bend the left end down and to the right, through the middle of bight A. It should just rest on top for now (no weaving). Secure the end to your board, where it was bent and lower down. Step 5: Rotate the right end counter-clockwise. Pass it over loop 1 at the top of the knot, and over the left end where it bends. Bring it under - over - under - over the next four segments down the middle of Bight B. Step 6: Use the left end again, which is resting on top of Bight A at the moment. Weave it under - over - under the three segments closest to the bottom of the bight. Step 7: Tighten and balance the knot, but leave some space. 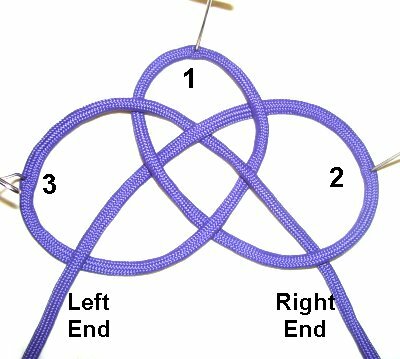 You could now use a second cord to double the knot and make it thicker (optional). Step 8: Tighten the knot further, progressing slowly from one end to the other. Double Coin Patterns should be tightened all the way to form the desired shape. 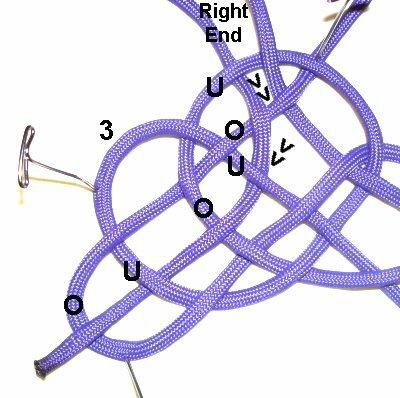 Step 1: Both Double Coin Patterns start the same way, with a Josephine/Double Coin knot. Use the instructions further up on the page. Mentally label the three loops as shown, and the ends where they are resting now. Step 2: Create bight A with the right end, moving counter-clockwise. Weave under - over - under - over the four segments, as you bring the end to the upper left. 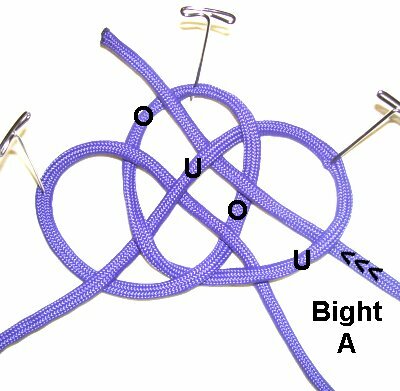 Step 3: Create bight B using the left end, moving clockwise. Pass over - under - over the segments of Loop 3. Bring it over the right end, and under the upper portion of Loop 1. Design Tip: Double Coin Patterns have very specific weaving styles, so pay close attention to the following details. 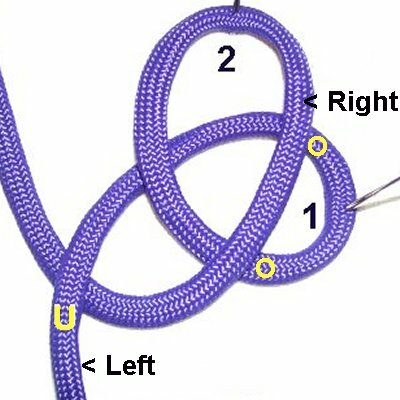 Spread the loops and bights so you have plenty of room to work. Step 4: Bring the right end (now on the upper left) under the top of Loop 1. Weave over - under - over - under - over the remaining segments, curving it so it goes down through the middle of bight B. 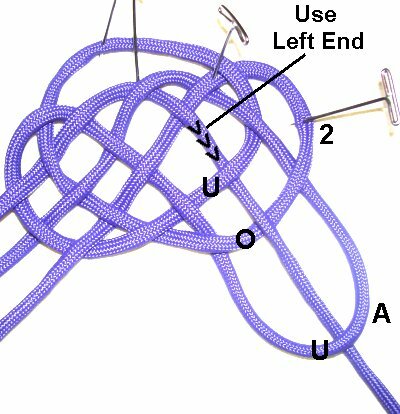 Step 5: Bring the left end over the top of Loop 1, on the right side of the knot. 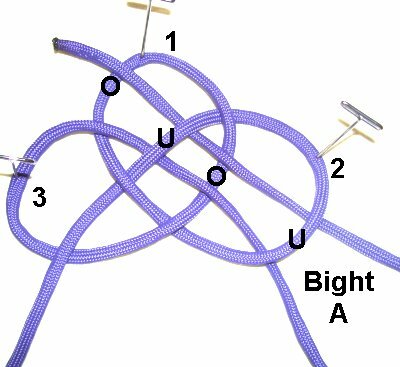 Weave it under - over - under - over - under the remaining segments, as you curve it down through the middle of bight A. Step 6: Tighten the Mayan Temple knot carefully, removing the slack from the loops, from one end to the other. Have any comments about the Double Coin Patterns? Contact Me.